Universal app, running equally well on iPhone/iPod Touch and iPad. MP3 audio files sound great while saving bandwidth and Dropbox storage. Accessible with VoiceOver for the visually impaired. 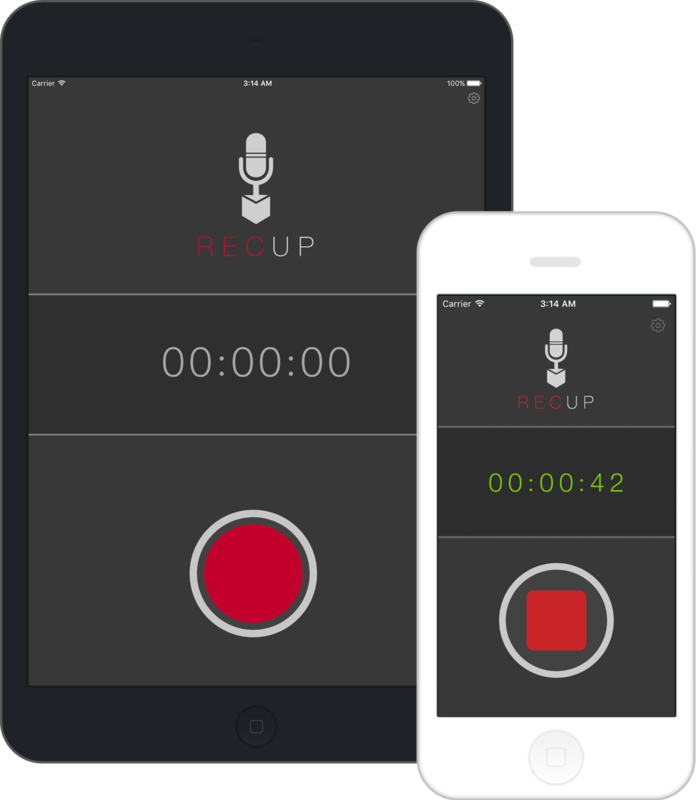 RecUp is streamlined to record and upload voice memos to Dropbox; there’s no need to name files or choose where to send them. If you need more control, RecUp might not be right for you, but I encourage you to consider how I use RecUp. I tried a lot of recorders and all felt needlessly complex, so I wrote RecUp to scratch my own itch. I find peace and comfort in the simplicity of its workflow. Peace comes from getting things off my mind as I quickly capture ideas when waking up, reminders while getting into my car, or insights when reading articles. Comfort comes from knowing that these snippets are in my Dropbox so I can process them when I'm ready. Part of my morning routine involves listening to everything I captured from the day before. Recording all my ideas seems to encourage more and better ideas to flow. Reviewing tasks in audio format forces me to focus on one thing at a time. Letting a task sit for a few hours before taking action can often bring further insight or even render the task unnecessary. Listening to audio reveals the emotion and energy behind a thought, which might be lost if I just typed it into a note or to-do app. Sharing an audio file with Dropbox can be much easier and more effective than sending an email. Simple and effective, just how we like ’em. …the next best thing to an actual dictaphone.